When it comes to slaying zombies, you can't beat The Walking Dead Season 7 Episode 9's epic scene which aired in the mid-season premiere "Rock in the Road." It was a scene that was deadly not for the humans for a change, but for the poor the walking dead. It was quite possibly a new world record for most walkers killed in under a minute. The season 7 episode 9 gave everyone plenty to mull over, as it featured Rick Grimes (Andrew Lincoln) trying to persuade the other communities—the Hilltop and the Kingdom—to join Rick's group in taking down Negan (Jeffrey Dean Morgan) and the Saviors. Neither Gregory or Ezekiel, the communities' leaders, were too keen on the idea, but after Rick's group left the Kingdom they came across a trap set by the Saviors to kill a herd of zombies patrolling the highway. And suddenly The Walking Dead Season 7 (read more about the season here) finally kicked up a few gears. It featured explosives attached to a long metal wire attached to two cars, with the idea that the walkers would walk into it and set off an explosion. However, Rick and his group stole the explosives (they'll come in handy when attacking Negan's HQ), but while they were doing that the herd of walkers appeared and were shuffling towards them. 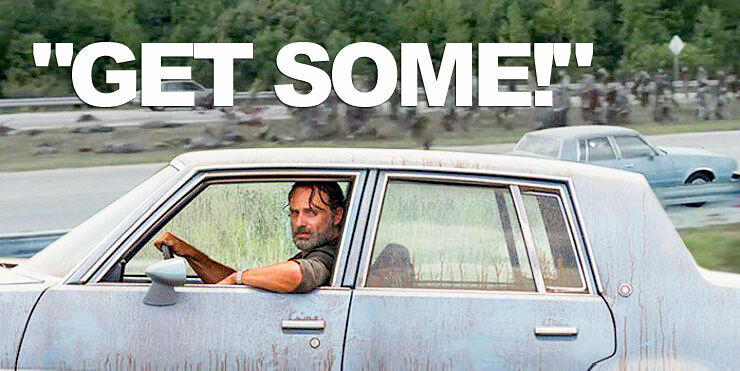 It resulted in Rick and Michonne (Danai Gurira) having to mow down the herd by driving the cars with the wire attached along in tandem, slicing the zombies in half like they were cutting through butter. It was gruesome and gory and made you want to leap from your chair and shout "GET SOME!" You can check out storyboards for The Walking Dead Season 7 Episode 9 over on Entertainment Weekly. Also Comicbook.com spoke to The Walking Dead executive producer Greg Nicotero about this mass zombie slaughter and he told them to begin with it wasn't even in the script. But then after reading the first draft and wanting to create a memorable scene Nicotero said the idea jumped out at him. "We had everything," he explains. "We had five cameras. We had two cameras on electric cars, they were driving parallel, and we had a zoom lens on so we were snap zooming into Rick and Michonne. Then we had the drone and we had a hundred zombies, and all the rest were all CG in the back. Having all the zombies approaching the cable and go away from us and then just cut right in it. It's so much fun. I'm so exited now about the moment that it ignited in my brain to see it finished." 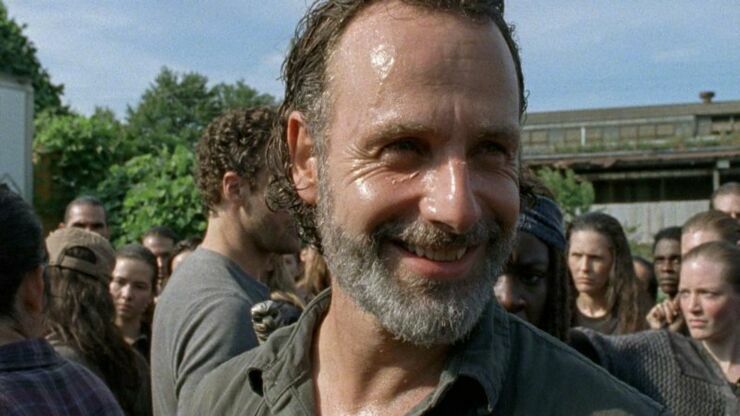 AMC's The Walking Dead Season 7 is back on our screens on Sunday 19th February with Episode 10 which is called "New Best Friends"—no doubt hinting at the new community we briefly saw at the end of "Rock in the Road" who are likely going to join Rick (hence his smile) in defeating the Saviors. You can check out a preview of Episode 10 in the trailer at the top of this post. The Walking Dead Season 7 Episode 9 - Rick gets ready for a new zombie killing record. 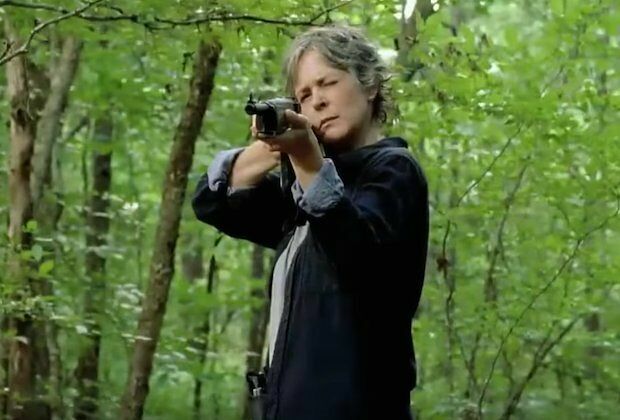 The Walking Dead Season 7 Episode 9 - Carol's got a gun!. The Walking Dead Season 7 Episode 9 - Just what is Rick smiling about?